Like many of you, I’ve got the planting bug right now. It’s still too early in my area to begin planting any annual fruits or vegetables in my garden, and my seedlings are still hanging out under the grow light in my basement doing their thing. This past Saturday, however, I decided that as it is several weeks prior to our last frost, it is an optimal time to plant some wildflower seeds and to provide plants that will attract those very important creatures to my yard and garden: birds, bees, butterflies, and other pollinators. As many of you may already be aware, many of our pollinators are in major trouble right now. Due to a number of issues, such as the loss of prairie habitat and the widespread use of certain types of agricultural chemicals, populations of beneficial insects have been plummeting in recent years. This is a huge problem for many reasons, but it is especially a problem for our food system. Most of the crops that we enjoy, including apples, onions, strawberries, beets, broccoli, tomatoes, and cabbages are pollinated by helpful creatures such as the honeybee. Home gardeners can play a very important role in helping pollinators. Using organic and ecological gardening and landscaping methods is a huge step in the right direction. By implementing such methods in your yard and garden, you will be avoiding the harmful chemicals that are negatively affecting pollinators, and you will also be attracting them to your garden, which ultimately leads to a more productive harvest for you. 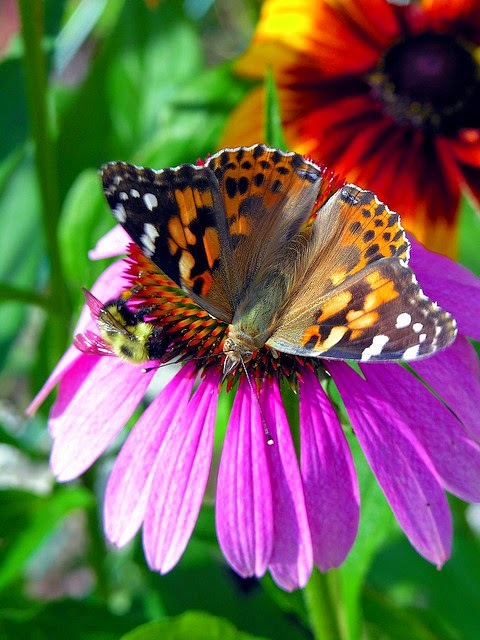 When you plant native plants and wildflowers in your garden, you are also providing a refuge for pollinators and other creatures amongst development, as much of our native prairie habitat in the United States has been either plowed under for monocrop agricultural purposes or paved over for development. In some cases, these native plantings in our gardens are the only refuges that remain for certain birds and pollinators. Wildflowers provide insects and wildlife with important food sources of seeds, nectar, pollen and fruits, as well as nesting sites, larval food, forage and shelter. Native wildflowers also attract many different types of insects that birds love to eat. Many native wild flowers are very beautiful, and like the Purple Coneflower (Echinacea), many are also useful to us as medicine. Admittedly, I am still in the process of learning about how to plant wildflower and other native plant seeds. Based upon my research, many of the species of wildflowers need to go through a cycle of freezing and thawing several times (the temperature conditions that naturally occur during Spring) to break the seed’s dormancy. 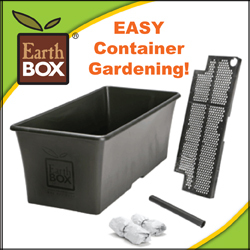 This is to prevent their germination during times that do not allow for optimal plant growth. To learn more about this process called stratification, I wrote a little bit about that during my post about starting seeds (check out Item #7), or you can check out this page from Hamilton Native Outpost or this document from the Missouri Botanical Garden. Prior to doing some wildflower and other native plantings, I encourage you to do some research about which plants are native to your area. By focusing your planting efforts on those plants that are native, they will be the most adapted to your area and climate, and your local pollinators will also most recognize those particular plant species. 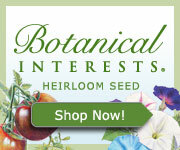 Whichever species you choose to plant, be sure to do your research and follow the directions on your seed packets. Tolerance of frost among species varies, so to be sure of particular species requirements, do a little bit of research. Native wildflowers and most other native prairie plants need to be planted in soil without weeds and grass present. This is one of the few circumstances where I advocate implementing disturbance to your soil. In this case, it is appropriate to provide open ground so that your native plants can thrive and won’t have to compete with weeds and grass. The difference between planting perennial native plants in this manner and our annual vegetable gardens is that once your perennial native plants are established, they will come back year after year, they will help to build your soil and help to hold it in place by way of the very deep roots that many of these plants have. You provide the disturbance once, and then you are generally leaving the soil alone and letting the plants do the work of soil building and maintenance. When I planted my wildflower seeds last Saturday, I used a rake and raked up the majority of the grass and weeds that were present in the area of my future wildflower garden to expose as much of the bare ground as possible. I then scattered and lightly raked in the seeds (the seed packets say to about a ¼” depth) to cover the seeds and to prevent birds from snacking on them. I planted a variety of seed mixes into my wildflower garden area: a general perennial wildflower mix, a “Songbird Delight” mix, and quite a few Purple Coneflower seeds. In the front of my house where there is mostly shade, I planted a “Shady Mix” of wildflower seeds. In the songbird seed mix, there were also some sunflower seeds. Sunflowers are annuals that don’t do well with frost, so I’ll probably need to scatter additional seeds from the mix once there is no more chance of frost for the season. I did reserve a patch in my wildflower garden to plant an additional mix of shorter varieties of sunflowers as well (the seed packet says they will get to be 16”-24” tall vs. the more typical 5’-8’ tall that most sunflowers will grow to be). I plan to leave most of the sunflower seed heads standing in the winter for the overwintering birds in my area (although our neighborhood squirrels will probably destroy them first…). I wasn’t able to get rid of all of the grass, but I think that I got rid of enough of it to allow an opportunity for the wildflowers to grow. I guess that time will tell. I also have a hill at the back of my yard that I would like to do some perennial plantings on so that my husband no longer needs to mow it and cause erosion, so I cleared away a portion of ground on the hill and planted some seeds there as well. I’m hoping to plant some fruit-bearing shrubs eventually that will cover the rest of the hill, but that will be a later phase. For now, I worked with what I knew that I could immediately implement. I’ll give updates in later posts about how everything is growing as the Spring progresses. For additional information about planting native plants and wildflowers, this article from Botanical Interests is a good reference. planted once all chance of frost is gone for the season. where it is very shady.